And so, the wait is over, and Kingdom of Heroes has been released. If you're reading this blog, there's a good chance you already know what that is, but, to summarise, it's the new HeroQuest sourcebook for the Kingdom of Sartar, a magical barbarian land dominated by the powers of Air and Earth. It is set in the world of Glorantha, where everyone can do magic, and there is a distinct bronze age vibe that makes it different from most other fantasy settings on the market. On the other hand, if, by some chance, you are actually more interested in my occasional musings on secularism and scepticism, then I’ll take the opportunity to promote the recently released Tim Minchin single “White Wine in the Sun”. This is a beautiful Christmas song about the values that are more important to many of us at this time of year than something that may, or may not, have happened in a stable 2,000 years ago. Buy the MP3 online from a legal download site for just 79p, and maybe it’ll get into the Christmas charts. It’d be a nice thought. Right, back onto gaming. Chances are that the first thing that will strike you about KoH is “blimey, is that the price?” And, yes, by RPing standards, it’s pretty darn expensive - although, if you’re willing to go PDF-only you can get it for much less than many D&D books by buying it online at sites like DriveThru RPG. The obvious question then, is whether the book is worth the price. I’d say that, if you’re already a fan of Glorantha, then yes, it is. (Of course, if your actual question parses as “is it worth my wife making me sleep on the couch for a month because I spent so much on an RP book?”, then you’re on your own). The reason I say this is partly the sheer size of the book; at a whopping 378 pages, it’s the equivalent of a number of normal RP supplements stuffed into one cover. And, even for the size, there’s a lot of text. The artwork is great (although some of it isn’t new), and there are even full colour maps inside, which you don’t see very often outside of the really big publishers. Certainly, when you compare it with just about anything previously published by Issaries/Moon Design, the physical quality is in an entirely new league. On the other hand, if you’re not already a fan, I can’t really deny that it has quite a steep entry price. Furthermore, one of the criticisms often levelled at Glorantha is that it’s too complicated, and there’s just too much to know to get into the setting. Dumping a book of this size down in front of someone is unlikely to dissuade them from that opinion! So, I’d have to say that this feels much more like a book for the fans than one for newcomers. The fact that the book has the name "Sartar" in huge letters on the cover, when nobody but a fan will have a clue what that means, supports the idea that this was what the publishers were aiming at; by comparison the more evocative "Kingdom of Heroes" title is in much smaller print. Perhaps the second question that might strike a potential purchaser is whether we really need this book. 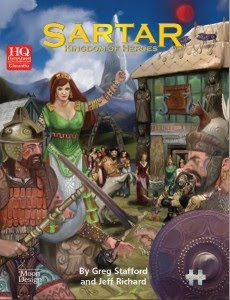 If you’re a fan of Glorantha, chances are that you already have the previous Sartar book, Thunder Rebels , not to mention later supplements covering the setting such as Land of Thunder and Storm Tribe. TR was a pretty damn good book, so do we really need a new book on more or less the same subject? Here, the issue is a little more complex. It’s perfectly possible to run a game set in Sartar with what’s already been published, so “need” is perhaps too strong a word. On the other hand, there is plenty of new material in here, and a number of things that improve on Thunder Rebels. But, then again, there are some other respects in which, in my opinion, Thunder Rebels did a better job than KoH. In fact, for reasons I’ll get into shortly, I’d say that owning Thunder Rebels will make it easier to get more out of this book – they complement each other, rather than the new book replacing the old one. The first part of the book concerns character generation. Here, the system is essentially the standard one from HeroQuest, although the original religious keyword has now been replaced by a choice of three runic affinities, which are described later on in the book. Aside from this, there is a cultural keyword that applies to all Sartarites, and then a choice of occupational keywords. A positive step here was to return to the culture-specific occupational keywords of Thunder Rebels, rather than the generic occupations of HQ1. This makes sense for a book about a specific culture, and removes some of the bland generalisations made necessary in HQ1. It also allows a greater range of occupations than official HQ1 publications had, with, for example, distinctions between common mercenaries and elite weaponthanes. Regrettably, though, this is one area where KoH falls short of the high standards set by Thunder Rebels. If you have read my review of HeroQuest 2, you may recall that I praised the preservation of the old method of describing keywords alongside the newer alternatives. Here, HQ2 is allowing flexibility for the needs of the GM and players. Unfortunately, it’s wise advice that KoH chooses to ignore. In this book, there are only “umbrella” keywords, and no indication of how to create the “package” sort. Indeed, there isn’t even any acknowledgement that this might be a problem! Essentially, all you get in your keyword descriptions is some text, with no clear guidance on what specific abilities they might include. For many people, that might not be an issue, but some might struggle to remember exactly what being, say, a skald, is supposed to imply in terms of abilities. Since many of the abilities that might be included under a keyword aren’t at all obvious (for example, that “entertainer” includes knife-fighting), I myself would certainly want to write down the individual abilities on a character sheet - even if I had to indent them and write ‘+0’ instead of a number. The writers do their best to get round this limitation in the text descriptions, and largely succeed when it comes to the magic, but they do tend to fall down when it comes to the occupations. Sure, it’s possible to deduce what most of the abilities are going to be from the prose, but a list would have been much simpler to use. Fortunately, anyone who owns Thunder Rebels can use the keywords in there if, like me, they find them more helpful. Of course, for many people, umbrella keywords will be an improvement over the way they were described in previous books – they might, for example, find it less limiting. But it’s a pity that KoH failed to acknowledge that not everyone might be the same when that variety is specifically catered for in the rulebook itself. After character generation we come to the clan generation system. A previous version of this was published in Barbarian Adventures way back when, but this one has been retouched since then. For those unfamiliar with the concept, this is a system for generating the history of the particular barbarian clan that your PCs come from. It guides the players through a series of questions about what their ancestors did at a particular time, steadily building up details of their clan as they do so, and providing a quick and entertaining course in the history at the same time. When I’ve done this before, with people mostly new to Glorantha, it proved popular, and it can be something of a fun game in its own right. The decisions you make all have some sort of effect on the final clan, and the starting resources available to the characters. For example, is the clan warlike, wealthy, open to new ideas, etc.? The system for working this out has been somewhat streamlined since the previous version, although there are still times when the GM will probably want to give the players some idea of what the outcomes of their decisions might be in advance. And this time, there is a nice-looking clan sheet to go with it, which you can fill in when you’ve finished. In part 2, we'll turn to the magic system, which represents perhaps the biggest change from earlier versions.